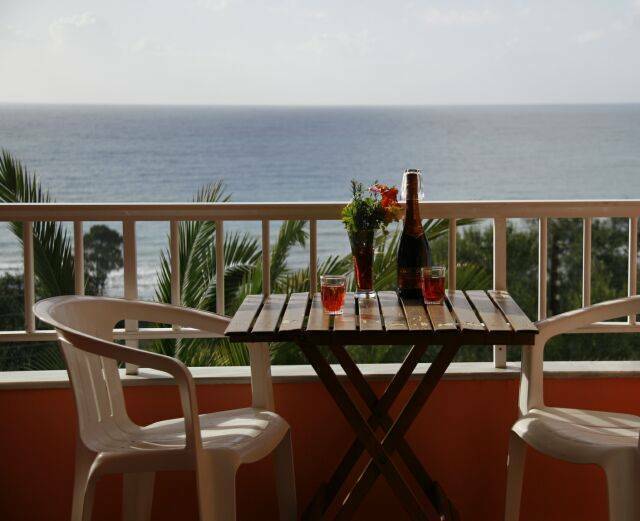 Beach front, rooms with spectacular sea views, amazing sunsets and beautiful sunny weather all year round. Prices include cooked breakfast and 3 course dinner, free transportation to the hotel. Rooms are A/C Open all Year. Pink Palace ... Die Zeit im Pink Palace verging viel zu schnell! Es ist immer etwas los und man lernt viele Leute kennen. Man kann Quads und Kajaks mieten und sie organisieren auch Ausflüge. BEACH FRONT, PRICES INCLUDE: room, cooked breakfast, 3 course Greek dinner, Taxes and free PICK UP ON arrival, from port or airport. All rooms are air-conditioned, with private bathroom & shower, breathtaking sea view balconies and amazing sunsets, telephones, hair dryers. 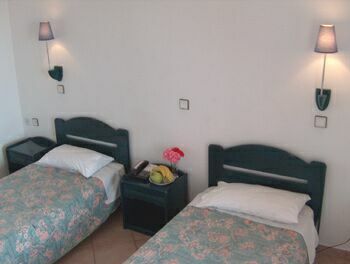 Available in single, double, triple, quad and 5 person rooms & doormrooms. Relax while swimming, or lounging beside the poolsize Jaccuzi, lay by one of Corfu's most beautiful crystal blue sandy beaches while reading a book or working on your tan. Enjoy the best sunsets, meet new people and make worldwide friends and life lasting memories. Go kayaking for a day and discover some of the private, secluded beaches nearby with new friends, try snorkelling, cliff diving, fishing, enjoy the beautiful scenery surrounding The Pink Palace while hiking or walking along the beach, or nearby mountains, visit historical villages and ancient castles, experience Greek culture, history and fine Greek cuisine. The Pink Palace is the perfect place to relax or party with other fellow travelers. You can rent quads (four wheelers) for the day, or we organise daily quad safari tours around the island. You can rent kayaks or take a kayak tour to nearby secluded bays. We organise a boat trip with cliff-diving, snorkelling and scuba diving. We have Internet access, ping-pong, foosball, basketball and volleyball (tournaments in high season). We also have a 24-hour bar and reception. The price of your accommodation includes a free pick up from the port or airport on arrival. It also includes a cooked breakfast and a three-course dinner. We also have a laundry service, a book exchange and a happy hour at the bar. Kayak rental & kayaking tours, quad (four wheeler) rental and safari, boat tours, 24-hour bar, 24-hour reception, Internet, ping-pong, basketball, volleyball, billiards, scuba diving, cliff diving, water skiing, jet skiing, snorkelling, paragliding, fooseball, town & Island tours, bus trips to Athens & back, mini market, jacuzzi, swimming pool, travel agency. We have single, double, triple, quad and 5 bedded rooms available, as well as dorm rooms. Most rooms have airconditioning and heating, telephone, hairdryer, private bathroom with shower and a private balcony with stunning beach views with amazing sunsets. The price of the room is per person per night and includes a cooked breakfast and a three course dinner also free pick up on ariival from either port or airport. Just email us your arriving details at: gmagdalena at hotmail. 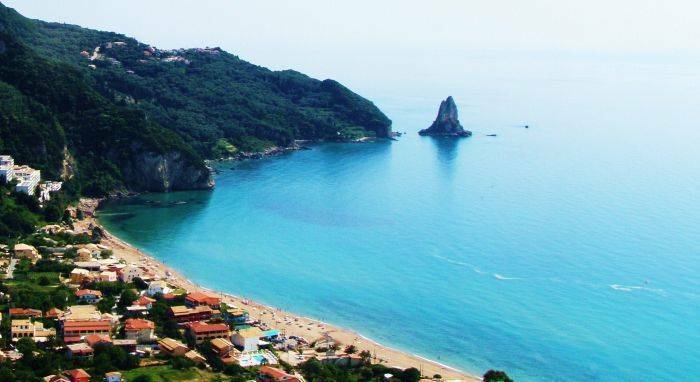 Located right on the sandy beach of Agios Gordios, famed for its best sunsets and crystal clear waters. Huge Sundeck overlooking the turquise blue Ionion sea. During the evening, The pink palace enjoys unrivalled views of the sunset across the ocean. Prices are per person per night. This includes cooked breakfast and three-course dinner. Also includes free pick up on arrival. You can cancel your reservation at any time up to 48 hours before arrival date free of charge. If no show on the day of arrival, Pink Palace will charge the first night of your stay. We offer free pick up when you arrive, just email us your arriving details, also there is a local public bus every hour from The Green bus station in Corfu town to Agios Gordios and vise versa.